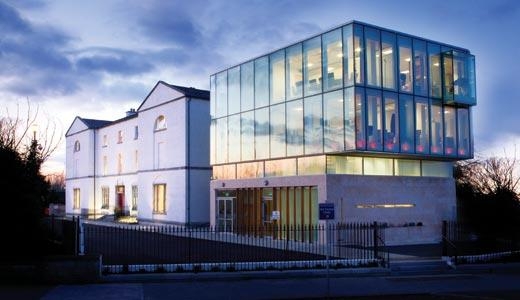 LIME WASHING YEATS COLLEGE | Mathieu & Mitchell Ltd.
Mathieu & Mitchell were appointed by Mr. Noel Gorman Architect to carry out lime washing to the West elevation of Yeats College. 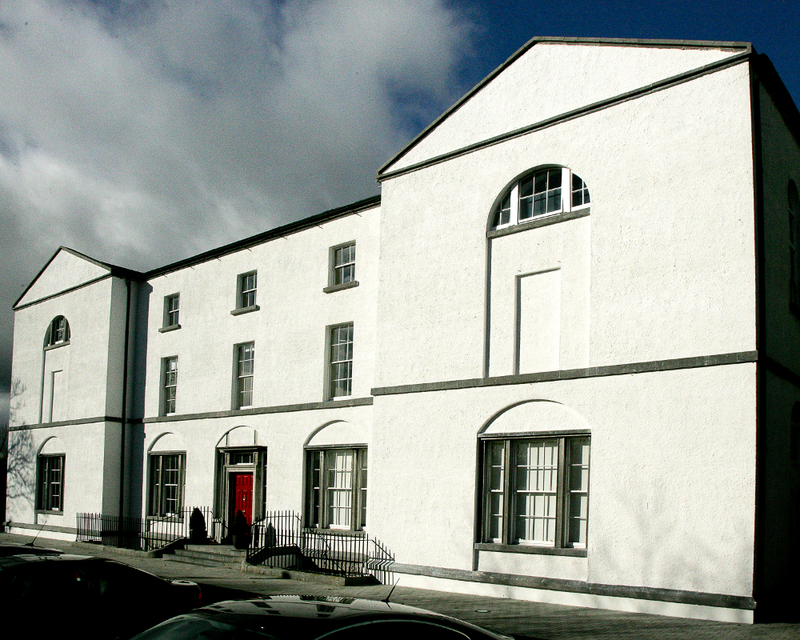 Yeats College is located in the Galway Grammar School on College Road in Galway City. The listed building which was restored in 2005 was built using combination of rubble stone, cut stone and clay brick bound together using lime mortar with a timber kingpost trussed roof covered with natural slate. The work was carried out during the month of August whilst the school was closed for summer holidays. Firstly a site specific risk assessment was carried out. 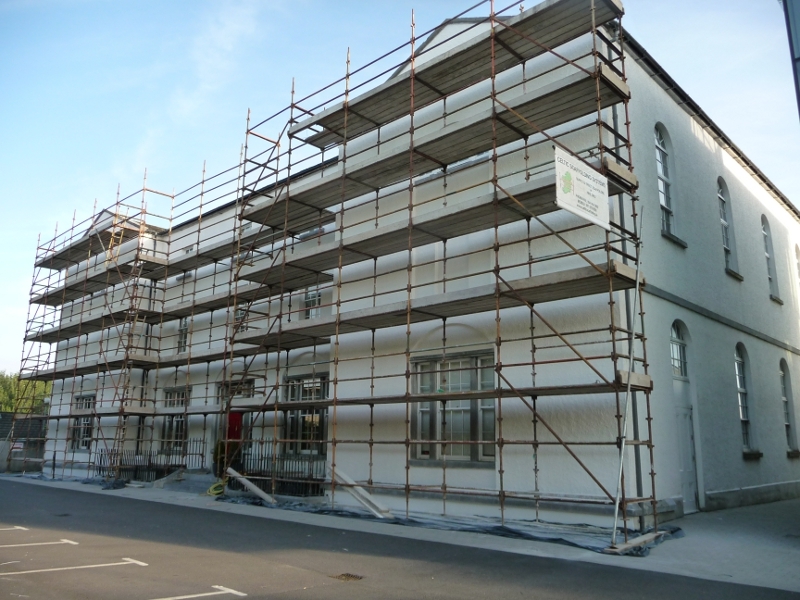 Then the building was scaffold to comply with Health & Safety Regulations. Green mesh netting was fitted to the scaffold to protect the lime wash from strong drying winds and strong direct sunlight. Fungus was treated with a suitable biocide and all dead material was rinsed off prior to lime washing. Three coats were applied. The mix for the lime wash was approximately 1/3 lime putty: 2/3 clean water. The last coat was from a premix from St Astier a lime product manufacturer. In this premix there is natural additive that will help the lime wash to perform better and last longer. A test panel was carried out first to ensure proper color. The wall was sprayed until the surface was damp but not running with water. One coat of lime wash was applied each day which allowed individual coats time to carbonate, as re-coating to soon would have resulted in the previous coat pulling away and hampering proper carbonation. With lime wash the material being applied to the wall surface is calcium hydroxide (suspended in water). Following application the water evaporates and atmospheric carbon dioxide readily combines with the wash to form calcium carbonate, a process known as carbonation. During the carbonation process the lime wash hardens, develops its color and makes it bond to the substrate forming what is in fact a thin sheet of limestone on the surface. The lime wash was applied using a large long hair brush. Vigorous horizontal, vertical and diagonal strokes ensured the wash was applied thinly and evenly. The work was carried out in a manner where we were following a wet edge in order to avoid scarring and lines from a build up of material. If it had been applied to thick or heavy this would have resulted in crazing and cracking.